“Miss Jeanette Rankin, candidate for congress, will be in Havre to talk to the people at open air meeting tonight, Aug. 14 at 8 o’clock, in front of Boone’s drug store. “Greater Publicity in Congressional Committees. “Miss Rankin has an intelligent grasp of Social and Industrial Conditions in Montana and in the United States, gained through her extensive travels and study. “Last Monday evening Miss Jeanette Rankin, of Helena, the first Montana woman to run for a seat in the United States congress, gave an address in the interests of her candidacy. A large crowd collected on the street near the Boone drug store and listened to a very interesting talk by Miss Rankin. Miss Rankin appealed to the voters, both men and women, for the protection of the children of the country, she said, “The interests of the women and children should be represented. All other big interests are represented, and surely the children are the biggest interest in any country. Montana may send a woman to congress to represent the women and children of the nation directly. “She stated that she was a strong advocate of the farm loan law and also of a law similar to the one in force in New Zealand, which enables laborers to borrow the capital to build homes for themselves, and pay back the loan in monthly installments. The best report was given in the August 15, 1916 issue of The Havre Daily Promoter, however, I only got part of the article before the microfilm machine decided to throw a temper tantrum and not print out copies. It does that on occasion. After all, it was donated 30 years ago this year to the Havre-Hill County Library by the Havre Rebekahs, and in human years the poor thing is probably pushing 100. Few people operate like they’re 20 when they are 100, so hopefully whatever ails the Microfilm Machine at the Library will pass and next week I can get my copies! However, what I did get contained more information than either the Plaindealer or the Democrat. 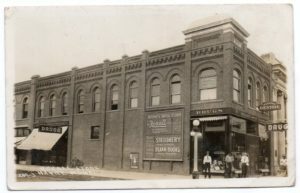 It reported around 300 men and women gathered on the street in front of Boone’s Drug Store, located on the southwest corner of First Street and Third Avenue, to hear her address. It also reported that Miss Rankin was “intellectual” and they were apparently impressed about her “obvious sincerity” and “her splendid ideals” of her platform, rather than poo-pooing it as the Democrat did. The article went on to outline her entire speech, which quite frankly is more impressive to me 100 years later than 95% of the political speeches given during this sordid election year. Here are two entries from the Plaindealer’s “Society” column, complete with misspelling, which I believe should be ‘gracious’ and not ‘fracious’! “At the residence of Mr. and Mrs. James Holland, Sr., last Monday evening, occurred one of the most successful social affairs of the month, when Mr. and Mrs. Holland gave a dancing party in honor of Miss Mary Roche of Omaha, who is visiting at the Holland home. “The rooms were beautifully decorated with nasturtiums, pansies and sweet peas. About seventy guest were invited and enjoyed the hospitality of the fracious host and delightful hostess. “The lawn and veranda were beautifully illuminated and refreshments were served on the lawn and in the rooms with their French windows opening to the floor. The guests enjoyed themselves by dancing and in conversation. French windows are similar to French doors, which are two panels that open with no center stile or vertical post in the middle. This allows for a greater opening for both concepts, should the need arise, as was the case for the Holland party. This article was published in the Havre Daily News on August 19, 2016.